We start this week’s blog with the good news that 5643 successfully operated a train from Embsay to Bolton Abbey yesterday, double-heading with Taff Vale 0-6-2T No.85 – a rare case of two ‘Taffy Tanks’ operating together! The run successfully drew to a conclusion the winter work on 5643 which has included the replacement of three stays. Well done to Keith and his team. 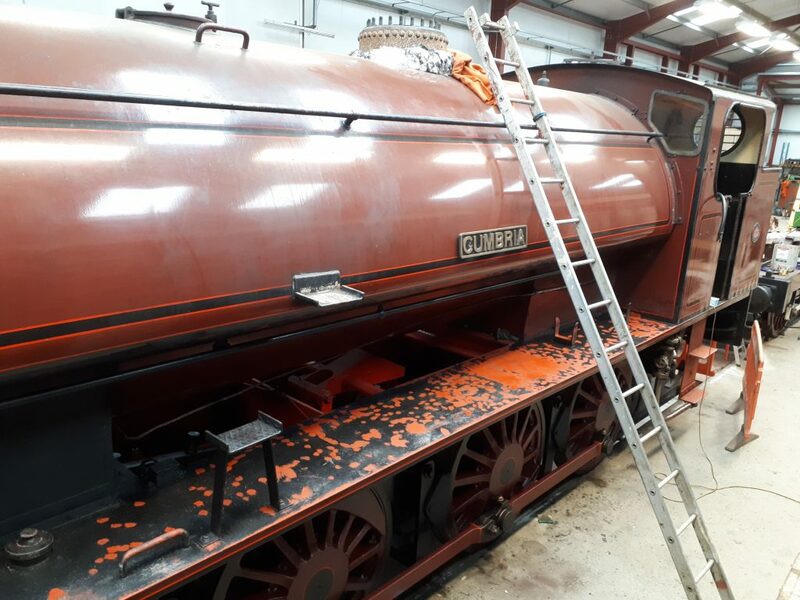 Back at Preston, it has very much been a case of ‘more of the same’ as our members have continued to clean up the Trust’s ‘Austerity’ 0-6-0ST Cumbria. The running plate and cab steps have been rubbed down and primed ready for the undercoat to be applied this week. New member Phil Scales is seen here busy with the sand paper. Work has also continued on Cumbria‘s regulator valve which has given trouble over the past year. We’ll spare you yet another photo of Bob with his feeler gauges but we can report that the sliding brass faces are very much close to being finished. Tim came in on Monday, Wednesday and Saturday to try and tame the ‘J’ pipe, which is also looking much closer to the finishing line. 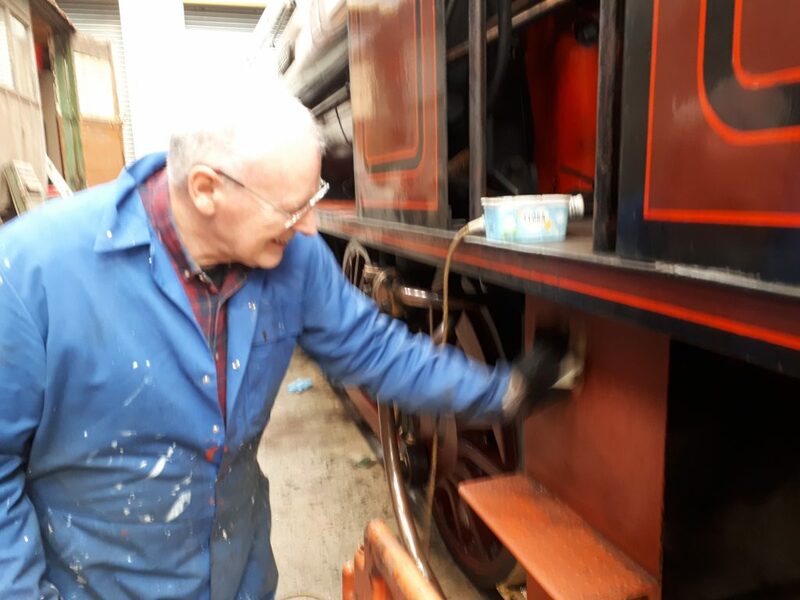 Alan Ogden has re-appeared from the south west to continue his work on Fluff‘s electrical systems whilst Howard, John Davis and David, among others, have again been working on the frames. There is promise of further progress on Caliban this week with John Marrow due to arrive tomorrow and Wednesday to re-bore the cylinders. 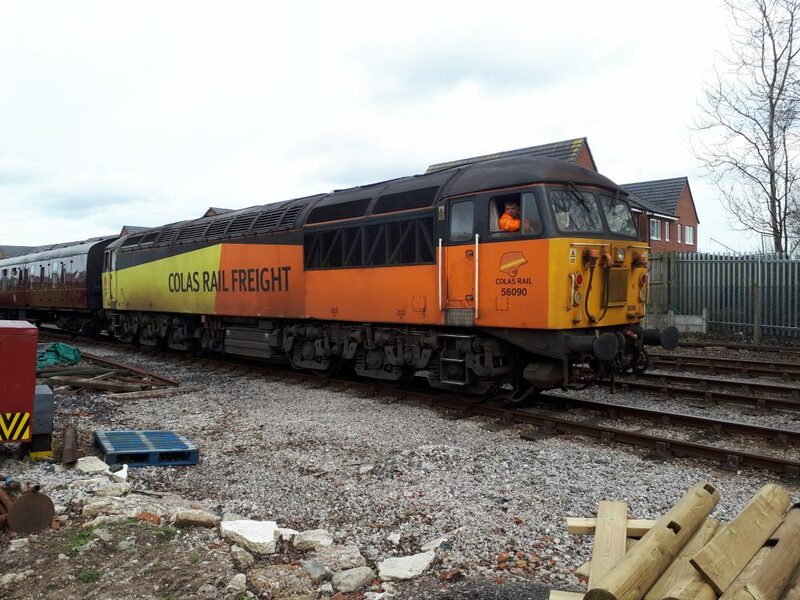 Saturday and Sunday marked the start of 2019 passenger services on the Ribble Steam Railway with a successful Diesel Gala. Guest Colas C0-C0 locomotive No. 56 090 is seen here on the end of one of the trains. Finally, we conclude with further good news in that the lease for the Furness Railway Trust Shed has been executed today. It appears that years of persistence have paid off and thanks go to everyone who has been involved in what has turned out to be rather a long drawn out process. We have a home that we can rightly call our very own at last!